Q: Would that treatment plan be as effective using braces behind the teeth as conventional braces? Q: Will treatment using Incognito braces behind the teeth be as effective as conventional braces? Riolo Orthodontics spent much of the last week in San Francisco at the 2015 annual session of the American Association of Orthodontists (AAO). There were also meetings held before the start of the AAO such as the American Lingual Orthodontist Association (ALOA) and the Society of orthodontic Educators (SOE) both of which were attended by Drs. Riolo and Bayirli. Dr Riolo also participated in the annual session lecturing on braces behind the teeth “Lingual Orthodontics: An Essential Tool for the Orthodontic Specialist”. Dr Riolo’s lecture discussed; why lingual orthodontics is an essential tool for the orthodontic specialist as well as why lingual orthodontics is hard. He also showed examples from our practice in Seattle illustrating the points make in his lecture. Dr. Bayirli moderated a lecture room on Tuesday from 1:00 to 4:30 themed “Ideas from around the World” many of these lectures dealt with issues associated with accelerated orthodontics. The office participated in continuing education as a group and learned about emerging technology’s such a medical 3D printing which will allow us to increase precision when fabricating orthodontic appliances using our intra-oral scanner. Orthodontic technology is rapidly changing and we pride ourselves on bring the latest advances to our patient in Seattle. Through our efforts at the University of Washington and participation in both national and international meetings we work to use evidence based treatment to achieve the best possible treatment outcome for our patients. We employ the latest digital technology to produce custom orthodontic treatment solutions for our patient such as Incognito custom braces behind the teeth, the SureSmile system when using braces on the front of the teeth and the Invisalign system when moving teeth with removable clear aligners. We are looking forward to the next annual meeting in Orlando Fl. in May of 2016. Riolo Orthodontics is participating at the 2015 Medical Dental Building Health Fair. We have a table setup with information regarding esthetic orthodontic treatment options including Invisalign and Incognito braces behind the teeth. 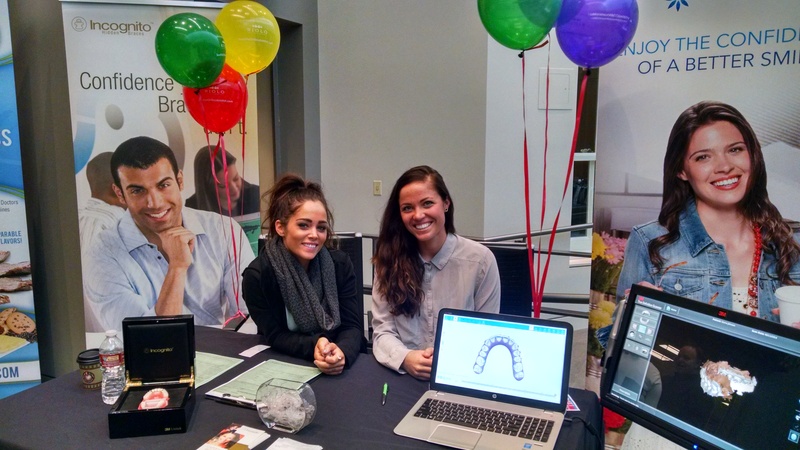 Cali and Stephanie have our TruDef intraoral scanner on display along with the Invisalign clincheck software. We are offering fee initial orthodontic records including the digital intraoral scan and the Invisalign treatment setup. We are also including a second appointment at no charge to review your Invisalign setup with Dr Riolo; you will be able to see your treatment result before we even begin aligner therapy with Invisalign! We are the largest provider of Incognito Invisable braces behind the teeth in the Pacific Northwest. Dr Riolo has been using Incognito lingual braces since 2006. Dr Riolo wore these braces behind his teeth himself so he understands this the Incognito system from multiple prospectives. Dr Riolo initially certified as an Incognito provider in 2006, Riolo orthodontics is now recognized as an “Center for Excellence” by 3M Unitek and Incognito Braces. Today lingual braces (braces behind the teeth) are used on about a third of our patients. 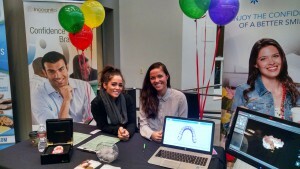 If you miss the Health Fair you can contact us at SeattleOrthodontist.com our Invisalign special offer is in effect until through the month of June.